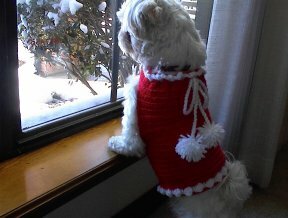 designed by Renata C. to compliment our Dog Sweater pattern. 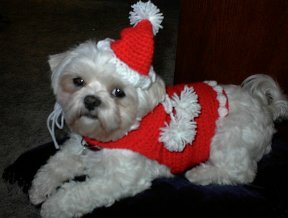 Click here for the easy dog sweater crochet pattern! The embellishments on this sweater pattern were designed by Renata C.
Please contact Renata if you find any errors. With body opening toward you and working in free loops of beginning chain on round 1 of bottom of sweater, join white with slip st in any chain (on the under part of sweater); ch 3, dc in next sc, work Bobble in next sc, (dc in next 2 sc, work Bobble in next sc) around; join with slip st to first dc, finish off. Then after I finished the bobble row, I added a row of red slip stitches over the bobble to make the end of the sweater red as Giget has white fur and I thought it would show up better. YO, insert hook in sc indicated, YO and pull up a loop, YO and draw through 2 loops on hook; repeat from * 3 times more, YO and draw through 4 loops on hook, YO and draw through remaining 2 loops on hook. All I did was work the sc sideways in the last row of hdc  so you sc, then chain three, skip sc, sc in next sc, chain three around neck. I also made a little tie to go around the neck. Crochet a chain the length of the neck plus more to be able to tie a bow and have extra to hang down and add pom poms. Then weave the chain (before you add the pom poms) around the last row picking up two hdc at a time around. This little tie made the neck fit better on Giget. Rnd 1 (right side): with red, ch 2, 4 sc in second ch from hook; do not join, place marker. Rnd 18: sc in each sc around; slip st in front loop only of next sc. Add a pom pom on the top and bend the top down a little and tack it that way to look like a Santa hat.